The mobile website of Engadin St. Moritz provides you at any time with all the information you need about the region in a format optimised for mobile phones. 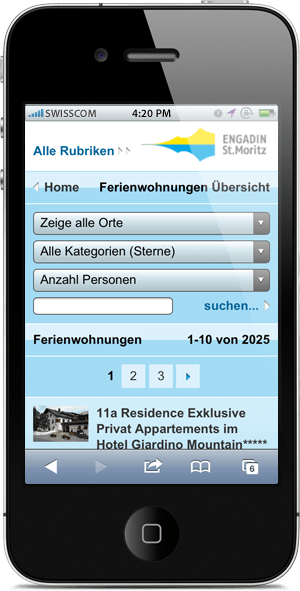 To access the Engadin St. Moritz website from your mobile phone, enter the URL www.engadin.stmoritz.ch/en or http://mobile.engadin.stmoritz.ch/en. By entering www.engadin.stmoritz.ch/en or http://mobile.engadin.stmoritz.ch/en on your Smartphone, you will automatically be taken to our Mobile Website, where you can find everything you need to know for your holiday in the Engadin. 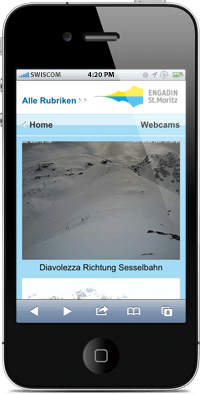 On the home page, you will find information on deals & offers, the mountain transport facilities and the weather forecast for the Engadin St. Moritz region, as well as links to the various live webcams. On the home page you will also find the Restaurants and Hotels links. Under each heading you will see one of the region’s hotels or restaurants displayed at random. Click on either of these suggestions to see full details of the property. Whether you are on the home page or any of the other pages, the recurring links right at the bottom are the same; these let you return directly to any of the main searches. 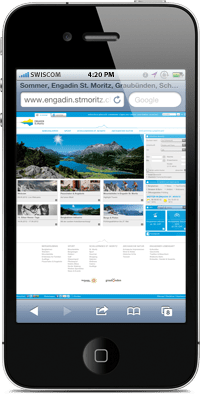 This link brings you straight back to the home page – and the weather forecast for the Engadin St. Moritz region. Under Weather you will find the current weather conditions in the Engadin St. Moritz region. If you click on more… at the top right, you will go to the dedicated Weather page with a 5-day forecast and full written details. You can also look up the current weather situation as well as local forecasts for each individual resort. 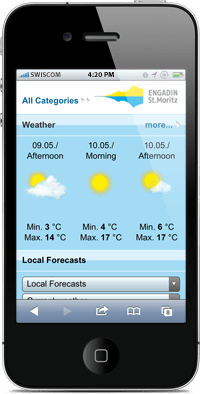 Simply go to Local Forecasts / Current Weather and select a resort from the drop-down menu. The home page shows an image from one of the many webcams in the Engadin St. Moritz region, chosen in alteration. If you click on “more…” above this image, you will be redirected to the full list of active webcams. Alternatively, scroll below the image and click on Webcams. Click on “Slope report” and you can see how many of the lifts and slopes in each ski area are open. Click on any of the individual areas for full details. Here you can see an overview of how many kilometres of cross-country ski trails are open in each sector. Once again you can click on any sector to see full details of individual trails. You can find out whether a winter hiking trail is open or closed through avalanche risk by following this link. 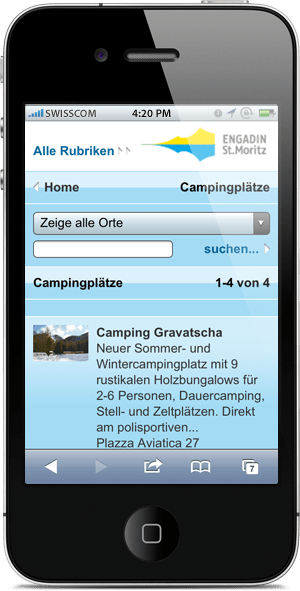 Click on it to see a list of the different hiking regions; select any one for details of the individual trails. 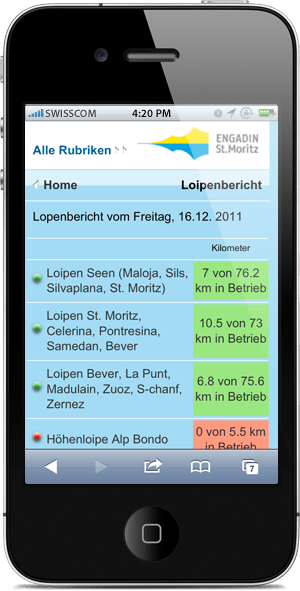 Follow this link for a list of all toboggan runs in the Engadin St. Moritz region, and to find out which are open or closed. Click on this link to see a list of all events in the Engadin St. Moritz region. 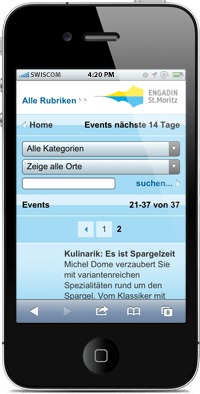 You can also select events by category or resort. Looking for a restaurant? Here you can search according to a variety of categories including resort, specialities, and family facilities. This links brings you straight to the hotel search engine, which allows you to search for hotels in the resort of your choice or according to the number of stars. This link brings you to the Holiday Apartments search engine, which allows you to find holiday homes in the resort of your choice. This link brings you to the Private Lodgings search engine, with which you can find a room in the resort of your choice. This link brings you to a list of group accommodation facilities, with the option of searching by resort. This link brings you to the Mountain Lodges search engine, which allows you to select mountain huts according to the nearest resort. This link brings you to the Camping search engine, which lets you search campsites in the resort of your choice. This link brings you to the picture gallery and a selection of films on the region. Hier erhalten Sie Strassen- und Bahnberichte aus dem Engadin. Click on this link to see the most important regional and national phone numbers at a glance. Click here once and the whole site switches to German. This link brings you to the desktop-view.